APD & New Mexico Commission for the Deaf and Hard of Hearing Team up for Coffee with a Cop. 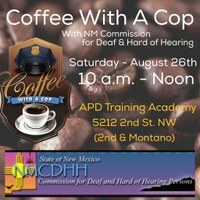 The Albuquerque Police Department’s Police and Community Together (PACT) Teams and the New Mexico Commission for the Deaf and Hard of Hearing invite those with hearing or visual impairments to come have a cup of coffee and discuss policing in our city. APD officers and sign language interpreters will be on hand to answer questions, listen to concerns and create an even better sense of community. The officers at this event work in different parts of the city and are part of the specialty units focused specifically on community policing. This event is only for the deaf, hard of hearing or blind in our community. The Department is also partnering to host multiple Coffee with a Cop opportunities throughout the city at local Starbucks locations. These events will be open to everyone. Later dates and locations will be announced on the department’s Facebook page (Follow us at: Albuquerque Police Department) and city website: www.cabq.gov/police/news. WHO: Members of the deaf, hard of hearing and blind community. Coffee with a Cop helps to build community through casual conversation and a relaxed atmosphere. The goal is to facilitate open discussion and create a stronger sense of partnership. To learn more about the National Coffee with a Cop Day as part of the U.S. Department of Justice’s Office of Community Oriented Policing, visit: http://coffeewithacop.com/national-day/.